This was my #1 personal favorite jacket back then. 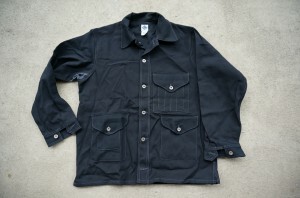 I can easily recall the mood when I designed it…..I wanted an American work jacket with some French flavor built-in, sort of like early American design which still retains much European influences, in the very simple way. The fit is kind of boxy, with round, slight drop-shoulders. 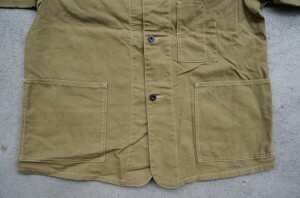 It has curvy, wide-spread center split collar without collar band, which is commonly seen on older French work or field jacket. 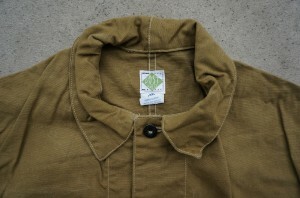 You can also find these collars on real old American work jacket as well, such as Sweet-Orr or Carhartt’s from 10~20s. Has rather plain 3pocket design, yet tastefully off-balanced chest pocket and purposely low-set pocket layouts give this jacket different mood from our earlier 3pocket #1101. Same cuff design as #1101. I always wanted these double needle stitching pass way over the bartack….but this example doesn’t…..well, life is not easy. Blue denim version. I remember this blue denim and indigo canvas version had charcoal stitching throughout. These may be our very first jackets with matching stitch. Banana collar ( I named it ) version was called #1109. Looks somewhat prisoner jacket, or ARMANI jacket from mid-90s. 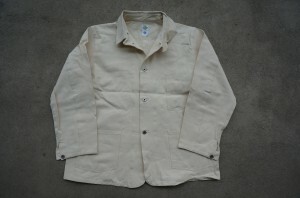 Looks more like chef’s jacket than stand collar…..sort of modified chef’s jacket collar. Photo by Roberto….our chief cutter. 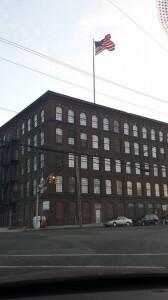 An old SINGER factory by the shore. I found some interesting stuff when we cleaned up our warehouse right before I left for Japan. This is from our very early years – one of the earliest POST shirts, a band collar version of our first shirt model #1201. 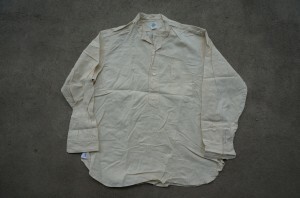 Having only one left chest pocket for pocket watch, it is plain as hell except some intricate vintage details such as oversized sleeve plackets,side gussets were made out of cotton herringbone tape with “POST” logo, gathered cuffs and back yoke – these were made only possible by hand, not machines. 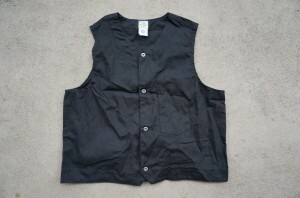 Our earliest vest, #1501 from second season. We did this vest in pigment-dyed canvas lined with then-new Polar Fleece on our first collection.This one is made of black canvas, having cinch back as well…..and has only one chest pocket as #1201, 1203. 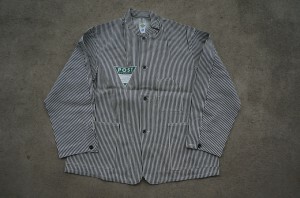 The earliest POST jacket, #1101 from 1993~4. 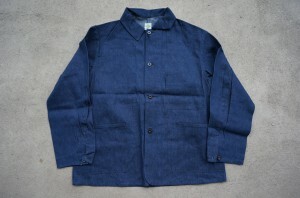 This is a simple 3 pocket jacket, with extended collar band with only one keyhole, closer-spaced second button, and one chest pocket for watch. Our earliest CRUZER, from early 2000s. 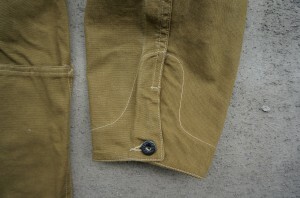 Looks loosely based on uncommon FILSON 3 pocket cruiser from the 50s, yet it has some flavor of its own. With older FILSON details and some other influences from our older Town & Country model, it looks somewhat transition status between Town & Country and our current CRUZERS. Has underarm gussets with thinner poplin fabrics, 40s BIG YANK styled cuffs which I frequently used on some early POST models. 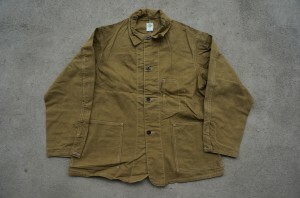 Short-lived 3 pocket jacket yet I remember I really liked wearing this model….. 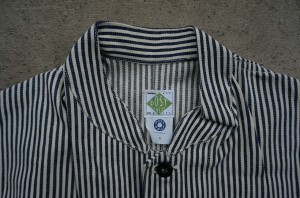 I designed this jacket with some French flavor… It has early American design with some leftover European flavor. P.S. 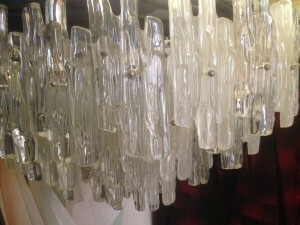 Here I have some stuff which I can’t take home…..this is one of them.I saw many nice modern European chandelier at Clignancourt last month….